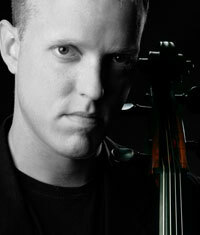 This Saturday, February 13, MSO Principal cellist Joe Johnson will present a master class for SAW students. Participants will include Joanna Boyland, Allen Kang, Samuel Lee, and Kartik Papatla, accompanied by pianist Andrea Velic. The class, which is free and open to the public, will take place in the UWM Peck School of the Arts Recital Hall from 10:30 a.m. to 12 Noon. For anyone arriving after 10:30, please enter quietly through the rear entrance to the Recital Hall (from the lobby) during applause only. Please do not enter from the inside hallway across from Room 180 once the class has started. Thank you for your cooperation. In 2002, Johnson was invited to the 12th International Tchaikovsky Competition in Moscow where he advanced to the semifinal round. In addition, he won first prize at the American String Teachers Association (ASTA) National Solo Competition. Johnson, a native of Chicago, received a bachelor’s degree from the Eastman School of Music, where he was a student of Steven Doane. He went on to earn a master’s degree from Northwestern University. Joseph Johnson became the Principal Cellist of the Milwaukee Symphony in September 2007 following an 11-year tenure with the Minnesota Orchestra. He has performed worldwide as soloist and chamber musician. He has soloed with the Minnesota Orchestra, the Oakland East Bay Symphony, Northwest Florida Philharmonic, the Fargo-Moorhead Symphony, and Minnesota Philharmonic. Johnson is principal cellist at the Grand Teton Music Festival, and has also performed at the Caramoor Chamber Music Festival, Bach Dancing and Dynamite, International Musicians’ Seminar at Prussia Cove, and the Pacific Music Festival in Sapporo, Japan.